Stories of a Traveling Diva: My Best Friend is a MOMMIE!!!!!!! Welcome to the world Maia! Born on September 9th, 2008. 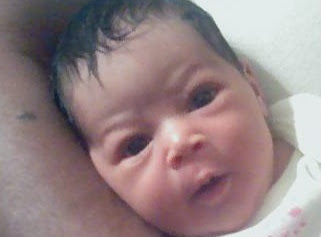 In this picture, she is 10 days old. I'm coming Maia, hold on....Aunti Lisa is on her way! I can't wait till your old enough for loud toys, playdo and weebles that wobble (stuff it down the drain, Maia, stuff it down the drain - that's my girl). You already have the look of power Diva Shopping! See ya on Thursday, pumkin! Get ready for your film debut. P.S. Manny & Val - GIMMIE MY BABY!!!!! Oh she's beautiful! Tell Manny and Val, congratulations from us! Look at my next spoiled diva!!!! Another baby I need to put on my "to steal" list.